Only beavers know if real timber tastes good. 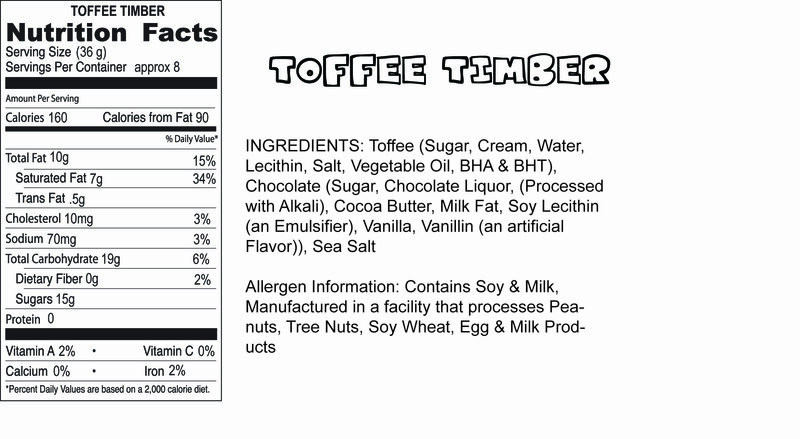 Add the word “toffee” in front of timber and the world magically opens up. Squares of buttery toffee covered in dark chocolate and sea salt remain one of our best sellers. From Megan of Seattle, Washington on 4/29/2016 . This toffee is perfection. I've been an English toffee lover for as long as I can remember but it's most frequently done with milk chocolate, which I usually love. However, the toffee is so sweet that the dark chocolate is actually a much better counterpart to it in my opinion. And then the sea salt. Ridiculous, I'm telling you. This is my new obsession, it is truly amazing. Make it last. It's too scrumptious to hurry through! A thick toffee with delicious dark chocolate coating and sprinkles of salt added on top for a true taste explosion! Thank you Droolin' Moose. It's a winner indeed. From Ryan of St.Paul, Minnesota on 3/24/2014 . The great toffee (which doesn't stick to your teeth!) 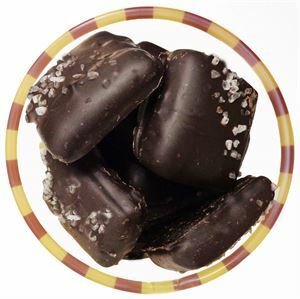 cloaked in dark chocolate along with the sea salt give the perfect combo of salty and sweet!